Growing up in a large Mexican family outside of Chicago, Carolina Diaz always had a special relationship with food. Whether cooking meals for her family or learning her Korean father’s mastery of balancing flavors, Diaz appreciated the art behind creating a culinary experience. 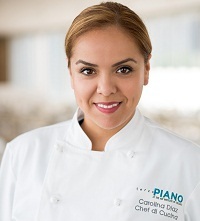 Initially a psychology major, Diaz switched to the Illinois Institute of Art, Chicago to follow her passion for cooking and focus on culinary management. She graduated in March 2010 with a bachelor’s degree in Applied Science. After beginning her culinary career as a line cook and intern at Red Light Restaurant under Chef Jackie Shen, she assumed a position in Chef Bill Kim’s empire. For two years she served as a line cook at Urban Belly and Belly Shack, learning how to run an effective, orderly, and smooth kitchen. In January 2012, Diaz shifted to Italian cuisine and worked as a line cook at Filini Bar and Restaurant in Chicago’s Radisson Blu Aqua Hotel under Chef Christian Fantoni, leading the restaurant’s homemade pasta production. In July 2012, Chef Bill Kim asked Diaz to assist him as sous chef for the opening of BellyQ. Diaz helped with menu planning, oversaw a staff of more than 30, and developed a cook-training program. After a successful opening, Diaz returned to Filini Restaurant and Bar as sous chef and was soon promoted to restaurant chef. Diaz joined the team at Terzo Piano at the Art Institute of Chicago in May 2016 as chef di cucina under acclaimed chef Tony Mantuano. She was drawn to the restaurant’s dedication to supporting local, organic, and sustainable foods and purveyors; its focus on Italian and Mediterranean cuisine; and the opportunity to learn from Chef Mantuano. Diaz looks forward to further establishing relationships with the Midwest’s best producers in order to let the ingredients represent themselves, catching them in peak perfection and featuring them in dishes that both locals and visitors will enjoy.